The Paulick Report offers a second special print publication for the Keeneland November Sale, available here and on the sales grounds in Lexington, Ky. In this edition of the PR Special, we learn more about Bill Landes of Hermitage Farm, recently named the Ted Bates Farm Manager of the Year. 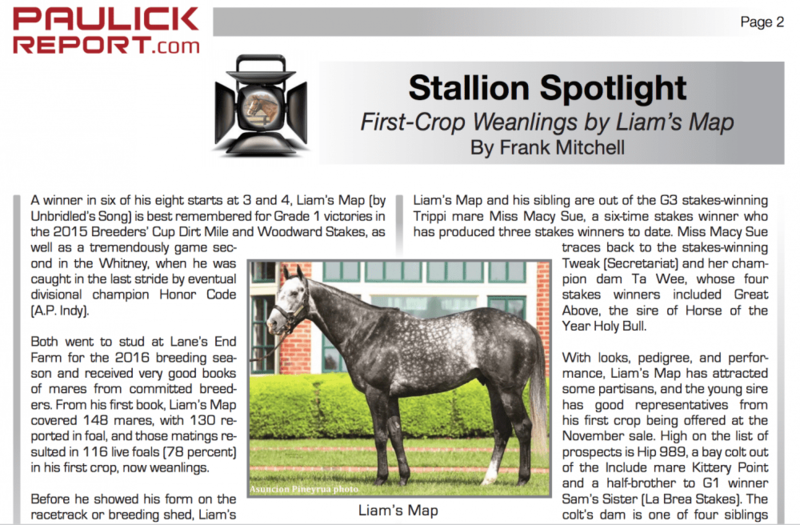 Frank Mitchell turns his Stallion Spotlight on the first-crop weanling offerings of Breeders' Cup champion Liam's Map at the breeding stock sale. Plus, Mitchell gives us another handful of hip numbers to keep on eye in Five To Watch. In the Honor Roll, Chelsea Hackbarth tells us about promising 2-year-old filly and Keeneland November sales grad Separationofpowers, while Ask Your Veterinarian looks at angular limb deformities. Plus, who was the unluckiest runner at the Breeders' Cup? Click here to read this edition of the PR Special Keeneland November. This entry was posted in PR Special, Ray's Paddock and tagged bill landes, Breeders' Cup, Frank Mitchell, hermitage farm, keeneland november, liam's map, PR special, separationofpowers, thoroughbred sales by Paulick Report Staff. Bookmark the permalink.